If you've registered but not yet paid your fees, please click here. If you plan to attend the LabourStart conference on 9-11 July 2010 at McMaster University School of Labour Studies, Hamilton, Ontario, please fill in this form. Conference fees include lunch on the Saturday and the Sunday. Your registration fees will assist us in funding participants from the Global South. A block of rooms has been booked in the McMaster student residences at the rate of C$59.75 per person per night, including a full breakfast. Delegates will be able to book their accommodation. Click here to book your accomodation now (opens in a new window). You must do this before Friday, 11 June 2010. We have limited opportunities for billeting. Please e-mail your dietary and other requirements to Canada@LabourStart.org in this regard. More information about the conference will be posted here as it becomes available. Our recommended travel agency. 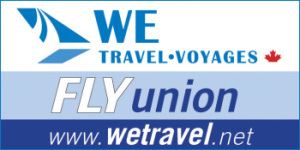 Call toll free number 1-888-676-7747 or email info@wetravel.net.